Winter is rapidly approaching. It is that time when we become anxious waiting for snow. It is also that time when some of us revisit the final days of last season! It is also that time of year when the Mores Creek Summit blog is prep for the upcoming season. You might notice changes to the Mores Creek Summit blog appearance, in particular to the "resources" sidebar. There are a number of links that provide valuable information to backcountry skiers venturing into Idaho's Winterland that were not obvious to some in lasts years format. This year format makes the resources links more accessible. Now - THE BIG ANNOUNCEMENT! Avalanche Education is coming to Mores Creek Summit. Avalanche Science LLC will be offering avalanche courses after obtaining a "Special Use Permit" from the USFS as well as an Outfitter and Guiding license from the State of Idaho. This website is named after Pilot Peak, the highest peak at Mores Creek Summit. At this website, you will find avalanche course dates for the 2018 Winter. 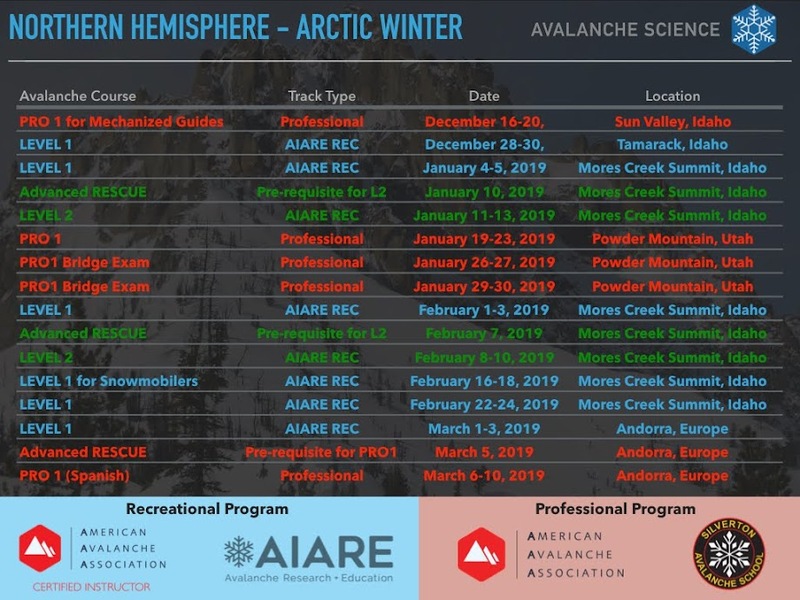 Avalanche Science is encouraging group reservations for these courses, which should not be difficult considering that the number of participants is capped at six. These courses are designed as a full three-day skiing experience, which is maximized with a small class size. Having Mores Creek Summit become a venue for avalanche education is exciting at many levels. These NEW courses make avalanche education accessible to many since it takes a short drive, roughly 50 miles from Boise, to access Mores Creek Summit backcountry skiing trailheads. In other words - for some, it will be now possible to sleep at their Boise home when participating in an avalanche class. For others, flying from Seattle, Portland, or San Francisco, will be able to enjoy Boise amenities while completing their avalanche certification during a leisure weekend. Furthermore, all course participants will be able to sample and enjoy some of the best powder skiing the wild mountains of Idaho has to offer. Avalanche Level 1 and Level 2 courses at Mores Creek Summit will exceed the new re-enacted American Avalanche Association (AAA) requirements. Each course will also include the new AAA rescue module at no additional cost. Certification from AAA Certified Instructor as well as AIARE will be provided to course participants.